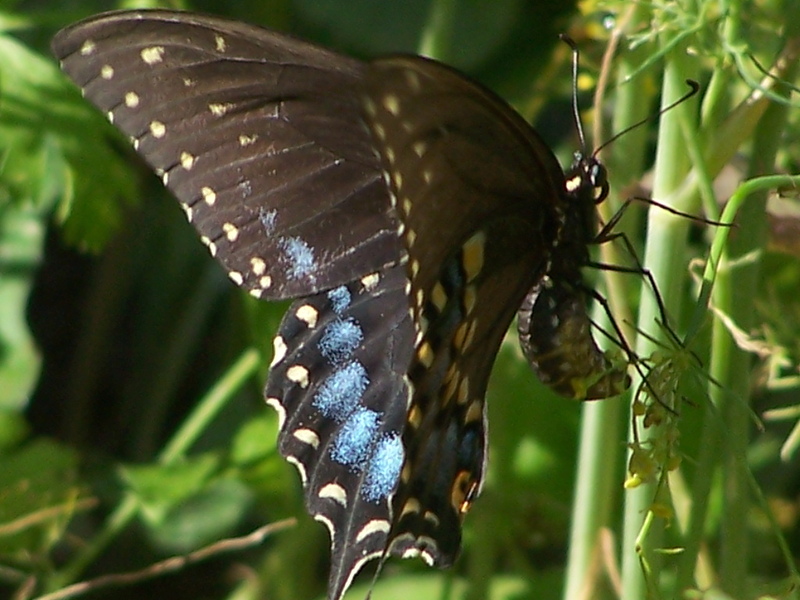 A butterfly, good food, and more FABRIC??!! I had hoped to blog this stuff yesterday, but spent most of the day battling round 2 of a headache. My shoulder is really flaring up, and I believe it causes part of my migraines. I don’t get to go the chiro again til Wednesday. Not soon enough! Now for the fun stuff! Did I say I wasn’t going to buy more fabric, til I had used up some of my stash? I know some of you have seen that stash in my other blog. I had a moment of weakness. I’m blaming it on my Mom, for getting the ball rolling with those batiks she bought for me, the email I got tempting me with words like “blowout sale” and “FREE shipping”. What’s an addict to do? Buy SIX more BOLTS of fabric, that’s what! It was $2.50 a yard! And it’s the good stuff…last year’s line or whatever, but hey, I have clothes in my closet way older than that, so why would I care if my fabric is a little “aged”? $2.50 a yard and FREE shipping…there really was no other option but to buy, buy, buy….right? I was a little embarassed by my weakness, so I thought I had changed the usual shipping address from my husbands shop to the home address, where I might have a chance to slip it onto my fabric shelves unnoticed. Mind you, he never complains about my fabric purchases. He is worth his weight in gold, and my DH is a BIG guy. He comes in after work Friday evening, toting it in the door. “You got packages.” I did? Ohhhhh yea. Hmmm….Two new western fabs to go with the two I already have. Here in Texas, cowboy fabrics will never go out of style. Paid for the other two bolts with only one baby quilt. The three pastels are Robyn Randolph’s. I needed more fabrics that I can use as background’s or coordinating fabrics to go with busier prints. And lastly, a pretty Tuscan textured fabric. I also ordered it in a pretty green, but alas, it was all sold out. Next, I thought I’d share our brunch with you. Another thing about living in Texas, if you like Mexican food, you can find it here. Whether you prefer authentic, TexMex, mild or smoking hot, we’ve got it. This would fall under the category of authentic, and once the green sauce is liberally applied on top, smoking hot. It comes from a local restaurant, La Casita. Started by a woman in one of those little snow cone type stands, serving some of the yummiest breakfast burritos. She quickly outgrew that little stand, and now has a walk-in restaurant. We ordered the huevos rancheros, for take out, yesterday. Here it is in the takeout box, two eggs on crispy corn tortillas, spicy shredded beef, refried beans, a homemade flour tortilla, hot green sauce, and a cheese quesadilla in a crispy corn tortilla, that you will see on my plate, once I moved it all over for easier eatin’. By the time I was finished, my tounge was burning and my nose was running. Yummy! I know that Carla R., Jan & Michelle will especially love this next part. 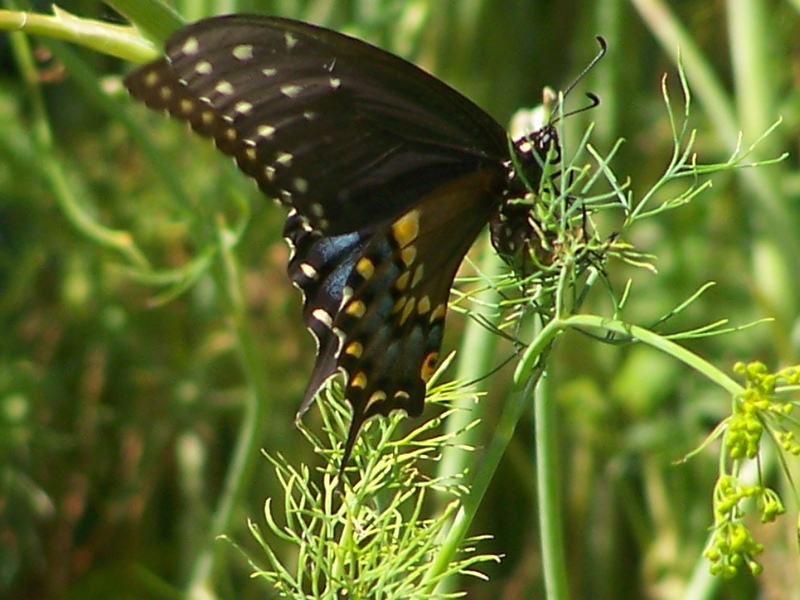 I got pics of a beautiful Swallowtail butterfly, laying more eggs, I think, on my dill yesterday. This is what the caterpillars will eventually turn into. I’m getting concerned that my dill supply is not staying up to the rate of demand. I planted more but it isn’t coming up too good. I was thrilled to finally get some butterfly pics. Here is a shot with the butterfly and the caterpillars in it. 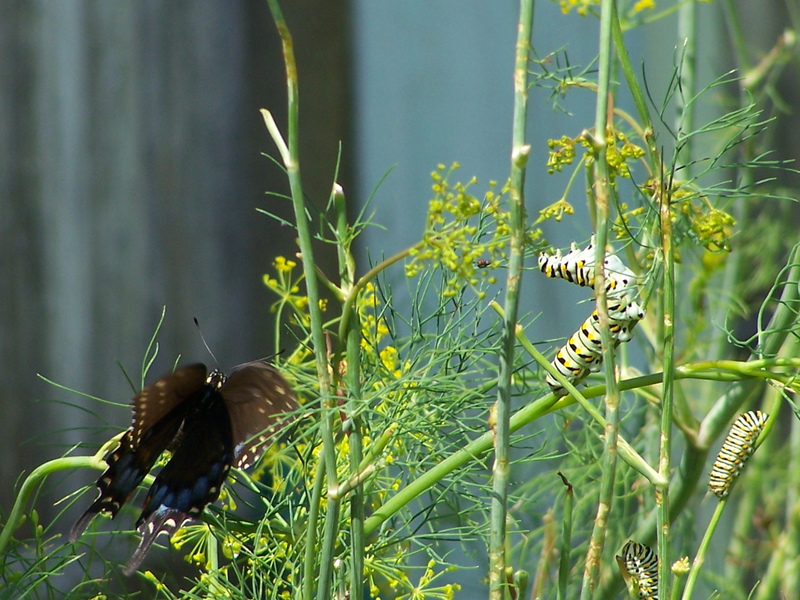 If you find these guys on your dill, parsley or whatever, please don’t see them as pests. Try to spare a bit of your garden for them, and let them have a chance to find their wings. I did manage to get the backing sewn together for Mom’s quilt. I am going to get it loaded today. Not sure if I will get anywhere on the quilting. NASCAR is at the Brickyard today. I will be watching the race this afternoon. Go Bobby! OK, I am jealous! First all I have is stinkin’ coffee (Jan it is the cheap stuff so I can say stinkin’) and you go and post these mouth watering pictures of food that now has my stomach making noises and my mouth watering. Not to mention I am glad that DH isn’t home or he would be talking about a trip to Texas after looking at those pictures. I can tardly beleive it has already been 8 months since we were there to see his sister. Then you go and post pictures of these great fabrics that you got a major bargain on. I think I am just gonna go pout and pop over to nascar.com and double check where Dale is starting. At least I too can skip the quilting stuff and watch the race this afternoon. No need for any jealousy there. OH the butterfly pictures are great I do love those! Did you all notice she taunted us with that fabulous price/bargain and then didn’t tell us where it was at??!! I noticed…. and Diane… really…. life is too short for bad coffee.. seriously… where are your priorities??? Randi, both the cabana boy and I have tried to get pics of the gold finches hanging out in the back yard and we’ve decided you have to come do it for us 😉 Great butterfly shots!!! The free shipping ended on the 27th, but they still have great prices. I would love to come take pics for you! And Diane, guess you are just gonna have to load up in that camper and come on down for some good Mexican food. Bring Ronda with ya! I wondered if you were going to give up the fabric source! LOL! Sorry to hear about your shoulder and headaches. Not sure what your shoulder problem is but I get huge muscle knots in my shoulder and the pain sometimes runs up my neck. I bought one of the TENNS machines while at MQX this year – that thing is worth it’s weight in gold! That is not the first time I’ve heard that about the TENNS…where can I find one of them? I think it would sure be worth a try! OK I made a big mistake and mentioned the food to DH. Now he has seen the pictures and tells me to get on the phone with that woman and have her mail it right on up. of course freeze it first and then send it in dry ice. I laughed at him. Then he told me if you won’t call her then learn how to make it. NEVER GONNA HAPPEN. This Minnesota grown American, with German and Austrian heritage, it just isn’t in my blood to make spicey food. Even with the best cook book, nope never! Ok, now Im hungry, Im gonna go make some chili, Adios! You are right… I love the caterpillar, such vibrant colors! You have beautiful pictures! Randi, I love the pictures of your garden and garden critters! I love birds, butterflies, dragonflies, and hummingbirds. We get big, yellow swallowtail butterflies around here. I love good Mexican food and bargain priced batiks, too! I think we all need a road trip to Texas!